The goal is to present a multidimensional view of three distinct populations of patients in pain, based on low, moderate and high opioid risk scores. With more knowledge about pain patients from a whole person perspective we will be able to target treatments to obtain the best therapeutic results with the least risk. The study was conducted at MPC, an interdisciplinary community-based pain medicine practice, based in Grand Rapids, MI established in 1984. The practice has 7 clinical locations covering a service area of 6 counties in West Michigan. The data was collected using the PRISM™ patient management system, a digital toolbox, containing among other components, the Pain Health Assessment (PHA), a patient reported health outcomes tool. The information is routinely gathered from chronic pain patients in the practice using IRB approved language in the consent forms. 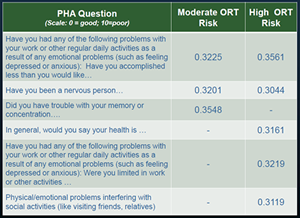 A Pearson correlation was conducted on de-identified data comparing the clinical and demographic questions in the PHA assessment and the ORT scores, as well as comparing the individual questions of the ORT to patient history and symptoms questions. The PHA is a multidimensional questionnaire completed by patients on an iPad prior to seeing the physician for the appointment. The PHA assesses disease presence, pain characteristics, physical function (e.g. self-care, mobility) and psychosocial function (e.g. emotional and social health dimensions of depression, anxiety, life control and social support). Questions from the SF-36 and the ORT are included. Responses were coded on an 11 point scale. 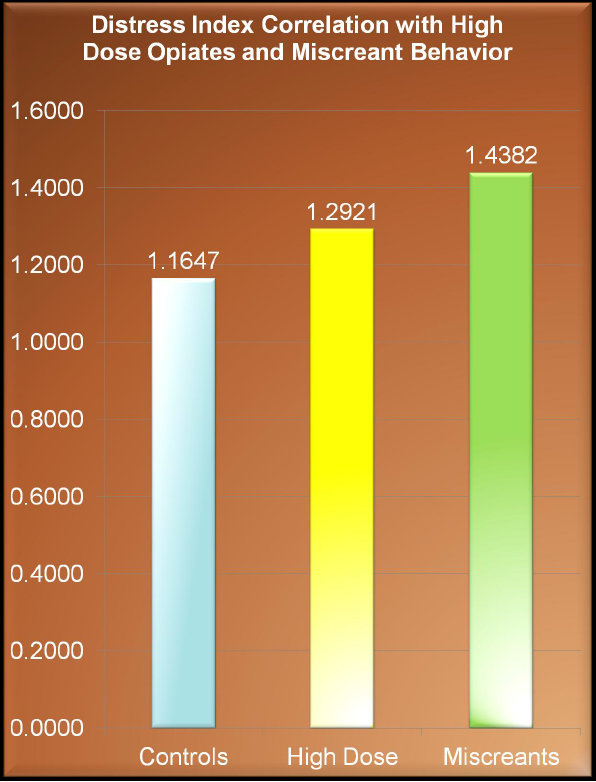 The study sample was comprised of 7,477 unique patients seen for their initial visit between 7/21/2011 and 9/14/2012. This data was then cross-referenced with the prescribing data of MPC. From this information, the sample was divided into six subgroups; subjects were stratified into low, moderate, and high risk, based on their ORT score, than further divided into those prescribed opiates and those not prescribed opiates. 20% of the patient population fell into the moderate or high risk tier. 11.5% of moderate to high risk patients were prescribed opiates. The male and female distributions in the tiers were comparable. Asking a longer series of questions can lead to more accurate reporting of symptoms. Symptoms are good predictors of moderate to high opioid risk. Internal depression scales correlated with ORT scores supporting the use of the ORT as a risk assessment tool. Opiate abuse potential is a factor that needs to be considered in all fields of medicine. This study supports the use of the ORT to assist in risk stratification. However, no single tool has proven to be 100% effective. A flaw in risk tools that rely on patient reporting is that those at risk for abuse might tend to underreport. Tools such as the PHA that encompass a wider range of patient dimensions may help mitigate the reporting bias present in short-form questionnaires. Studies of actual observed behavior would complement self-reporting tools. Use multimodal approach to understand the patient for effective assessment and to increase the accuracy of risk stratification. Target individual symptom dimensions, as well as diagnoses, to help decrease the reporting-bias of the patients. Conduct studies correlating the individual risk-granting factors on current risk tools with observed aberrant behavior. The goal is to refine specificity and sensitivity of the ORT and its use as a predictive tool for narcotic misuse and abuse. The study was conducted at MPC, an interdisciplinary community-based pain medicine practice, based in Grand Rapids, MI, established in 1984. The practice has 7 clinical locations covering a service area of 6 counties in West Michigan. The data was collected using the PRISM™ patient management system, a digital toolbox, containing among other components, the Pain Health Assessment (PHA), a patient reported health outcomes tool. The information is routinely gathered from chronic pain patients in the practice using IRB approved language in the consent forms. A detailed analysis of observed behaviors associated with narcotic misuse and/or patients on high dose narcotics was constructed and correlated with elements in the PHA and ORT. An independent-samples t-test was run on 13,986 de-identified unique patients. Data was further evaluated using Shapiro-Wilks test and Chi-squared tests. A multidimensional structured self-report questionnaire completed on an I Pad prior to seeing the physician. The PHA assesses disease presence, pain characteristics, physical function (e.g. self-care, mobility) and psychosocial function (e.g. emotional and social health dimensions of depression, anxiety, life control and social support). Questions from the SF-36 and the ORT are included. Responses were coded on an 11 point scale with 0 “most positive” and 10 “most negative”. “miscreants” and an additional 704 in the high dose narcotic consumption category receiving greater than 100 mg of oral morphine equivalents per day. The Distress Index was compared with the sum scores of each of the three subject groups to determine if there were differences. 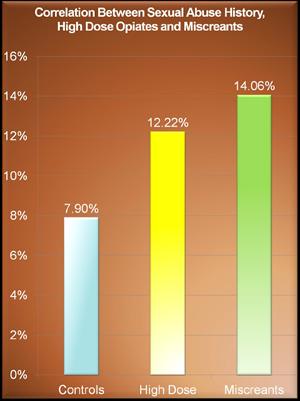 The Distress Index sum score showed statistical significance between the groups. 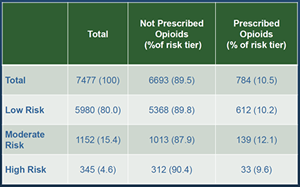 Our data supports the ORT as a tool in assessing the risk of opioid misuse. Also, a history of sexual abuse is a valid component which poses a weak but definite increase in risk for narcotic misuse. Elements in the PHA, including the Depression/Anxiety Index, the Anger and Relationship Index and Life Control Index can augment the ORT as a predictor of opioid misuse.3,4 Further analysis of PHA data, to be detailed later, will indicate additional correlations that could be predictive of opioid misuse. RT scores were significantly different for miscreants vs. controls. 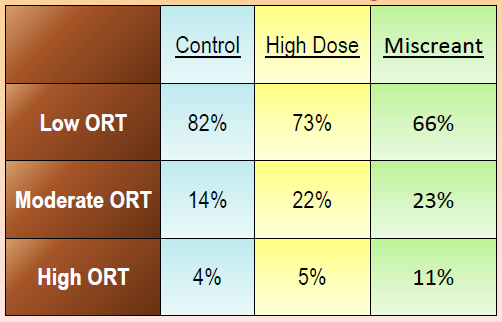 ORT scores were significantly different for high opioid users vs. controls. MPC now has data on over 1800 miscreants and high dose users. This data reveals additional markers that distinguish between miscreants/high dose and controls. FORT LAUDERDALE, FLA. – Analysis of data from more than 13,000 patients at a large pain management practice shows that a self-reported history of sexual abuse and issues with anger, impairment of life control, marital status, and level of education are among predictors of patients’ tendency to misuse opioids. The physician group, led by Dr. Mark Gostine, is planning to use the findings to help refine the specificity and sensitivity of an existing opioid risk assessment tool called the Opioid Risk Tool (ORT). "What we’re trying to do is to take ORT 1.0 and create ORT 2.0," said Dr. Gostine, president of Michigan Pain Consultants in Grand Rapids. 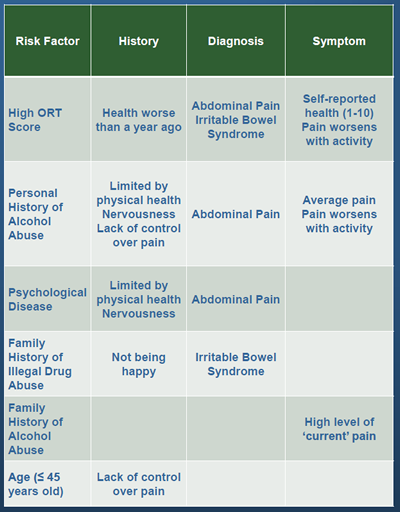 The ORT was developed by Dr. Lynn Webster with the aim of identifying patients at risk of misusing opioids (Pain Med. 2005;6:432-42). The questionnaire seeks personal and family history of substance abuse, history of preadolescent sexual abuse, and a history of certain psychological disorders. "The Gostine study is a significant contribution because of the number of subjects in the analysis," said Dr. Webster, who was not involved in the study. "I’m not aware of any opioid risk tool that has been evaluated in such a large population. It supports the risk factors that are identified in the Opioid Risk Tool but also suggests that the ORT could be improved with some modification." The abuse of prescription drugs and overdoses stemming from their use became one of the top public health concerns starting in the 1990s. Their abuse continues to be the fastest-growing drug problem in the United States (MMWR 2012;61:10-13). The increase in unintentional overdoses has been mostly driven by opioids in recent years, according to the Centers for Disease Control and Prevention. 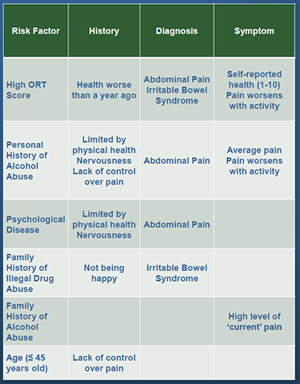 Physicians at Michigan Pain Consultants have been using the five-question ORT as part of their 120-question Pain Health Assessment that they give to chronic pain patients on an iPad prior to seeing the doctor. The form assesses disease presence, pain characteristics, physical function, and psychosocial function. "Anybody with a high ORT score had a problem with narcotics," said Dr. Gostine in an interview. 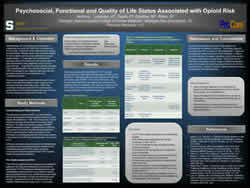 "However, two-thirds of the patients who misused narcotics had low ORT scores. So we wanted to find out what other elements in our database indicated that these patients are problematic, and can we use that to predict which patients will misuse medications." 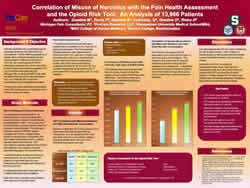 They conducted an analysis of observed behaviors associated with narcotic misuse and/or patients on high-dose narcotics. 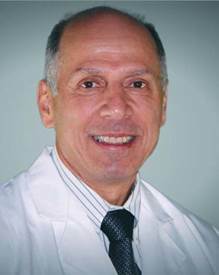 Dr. Gostine and his colleagues identified "miscreants" (256 patients) as patients who were flagged by the Michigan Automated Pharmacy Surveillance Program, had abnormal urine drug screens, had problems managing opiate prescriptions, and/or had poor behavior with clinic staff regarding opiate prescriptions. They also identified an additional 704 patients who consumed a high dose of narcotics, defined as greater than 100 mg of oral morphine equivalents per day. The investigators then compared the data on these two groups with the rest of their patient population (n = 13,026). The investigators found a higher ORT score significantly more often among people with miscreant behavior (11%) than among those with high-dose opioid use (5%) or controls (4%). Low ORT scores occurred in 66% of individuals with miscreant behavior, compared with 73% of people in the high-dose group and 82% of the control group, Dr. Gostine said at the annual meeting of the American Academy of Pain Medicine. The results also showed a correlation between the distress index – which uses a Likert-type numerical scale to score responses to questions relating to anger, depression, anxiety, and life control – and those identified as miscreants and those who consumed high doses of narcotics. In addition, a history of sexual abuse was associated with being a miscreant (14%) and high-dose consumer (12%), compared with the control group (8%). "Two other factors emerged: Marital status seems to be predictive, and patients with a higher level of education seem to be less likely to misuse," said Dr. Gostine. "Never married increases the risk of being a miscreant by 100% versus currently married. With our large numbers of miscreants and controls, this is highly significant, but these are early, provisional numbers." He added that the rate of miscreant behavior among high school graduates is 50% higher than that of 4-year college graduates. "This is also significant, but these are provisional numbers," he said. "We have also confirmed the link with smoking and prescription drug misuse. Smoking almost doubles the risk of opioid misuse, again a provisional number, which we will look at in more detail with the larger numbers [1,800] we have now accrued." Dr. Gostine said that he is planning to publish the findings. After refinement of the ORT, which is currently in the public domain and available to physicians, the tool might expand to 15 questions – a short-enough questionnaire that patients can fill out in 2 or 3 minutes. If the questionnaires are fed into electronic medical records, as they are in Dr. Gostine’s practice, "the doctor can find out whether [the patient] is someone they should be nervous about or someone they can trust" when it comes to prescribing opioids. Dr. Gostine and his partner, Dr. Fred Davis, developed the Prism Pain Health Assessment that was used to capture and analyze the data. The product is now commercially available. Dr. Webster has received honoraria/travel support from AstraZeneca, Covidien Mallinckrodt, and other companies.